Home » Health » I'm a NURSE :) » Iligtas sa Tigdas ang 'Pinas! Iligtas sa Tigdas ang 'Pinas! This campaign also aims to immunize children against measles-rubella particularly those children who were missed by the routine measles immunization and give booster doses to those who have already received measles immunization to reduce the pool of susceptible to the disease. From April 4 to May 4, 2011, expect vaccination teams or “Bakunadoors” to be knocking at your door to give free measles and German measles vaccines to children aged nine months to below eight years old. The health department advises that parents submit eligible children for vaccination even if they have previous measles vaccinations or if they have already suffered from measles. Aside from vaccines, some local governments will also be giving out free capsules of Vitamin A, which is an important micronutrient for good eyesight, strong bones, and a healthy immune system. Isn't it nice? Atleast the government is doing something to save our children from getting this fatal disease. However, sad to say that, there are still people who don't understand the importance of this campaign. Some would even hide their children so they won't have the vaccine. Some would say that, "iiyak e..." [What a lame excuse!] There are those who would say, "Yaan nyo na sa susunod na lang." or something like, "Wag nyo pilitin kung ayaw ng bata!" Gosh. Do I need to say anything more? So, how do I know all of these? I guess, proper and extensive information dissemination should be implemented by local officials. Educate the public so that the family too, will be of help rather than hindrance to achieving our goal---to save our children. 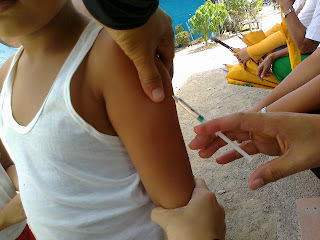 Measles-Rubella vaccine 0.5ml given subcutaneously. After a month, I hope that my friends would still recognize me. hehe... kidding.